Each and every house offers a different number of bedrooms, bathrooms and amenities. In addition, many are uniquely decorated and named. 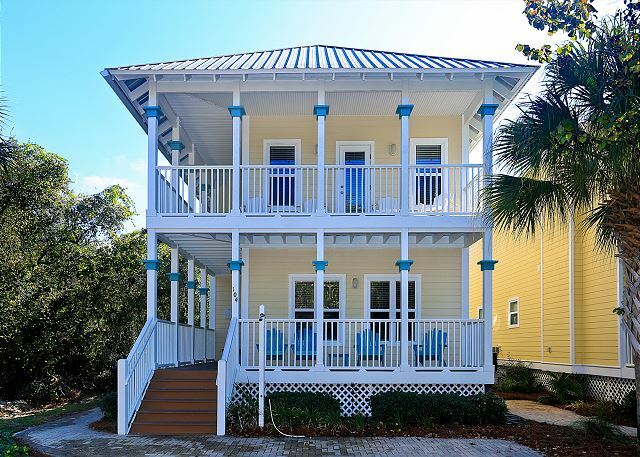 The neighborhood feel and the one-of-a-kind houses make Old Florida Village stand out among 30A rentals. With its residential setting, guests can escape from the typical hustle and bustle found in high-density tourist areas. Although cars are driven in this neighborhood, guests many just find themselves renting beach bikes and enjoying the slower pace while exploring the area. Golf enthusiasts will enjoy playing a round or two or three on the Sandestin Golf Course. Those who may be concerned that the locale is too residential need not fear. There are restaurants and shops aplenty in the community. Nearby Gulf Place Town Center is famous for its hundreds of shops and its wide range of entertainment options. Visitors can purchase clothing, accessories and art. Sports equipment is available for rental. In addition, Gulf Place offers a wide variety of service-oriented shops and several restaurants. It partners with Silver Sands Mall and Factory Outlet to provide a complete shopping experience for guests of all ages. Local residents and guests of the many 30A rentals rave about the GoatFeathers restaurant. Its unusual name comes from a quote by novelist Ellis Parker Butler who wrote “Goatfeathers are the distractions, side lines, and deflections that take a man’s attention from his own business and keep him from getting ahead.” While the food served in this restaurant is certainly a welcome distraction from the ordinary cooking of daily life, this restaurant has surely gotten ahead. Open since 1988, it prides itself on simple, but high-quality food along with never disappointing its customers. Visiting the beach while staying here is each due to having 2 public beach accesses only one quarter of a mile away in either direction. Old Florida Beach and Dune Allen Beach are within easy reach by bicycle or car. Both offer public parking and clean, public facilities. Local, quintessential Florida villages such as Grayton Beach, Watercolor and Seaside make great day trips when looking for new places to explore.